I started off my driving career in Scotland when I graduated from High School in 1969 and bought a small 49cc motorcycle to drive to and from college. As soon as I passed my driver’s test, I quickly leapfrogged into fast bikes with a BSA 654cc Lightning and by 1973 I owned the fastest street-legal motorcycle in the UK, a one-off custom-built 165mph JapAuto race-tuned 960cc Honda – so even early on in my driving career at age 22, I had developed a taste for power and speed. 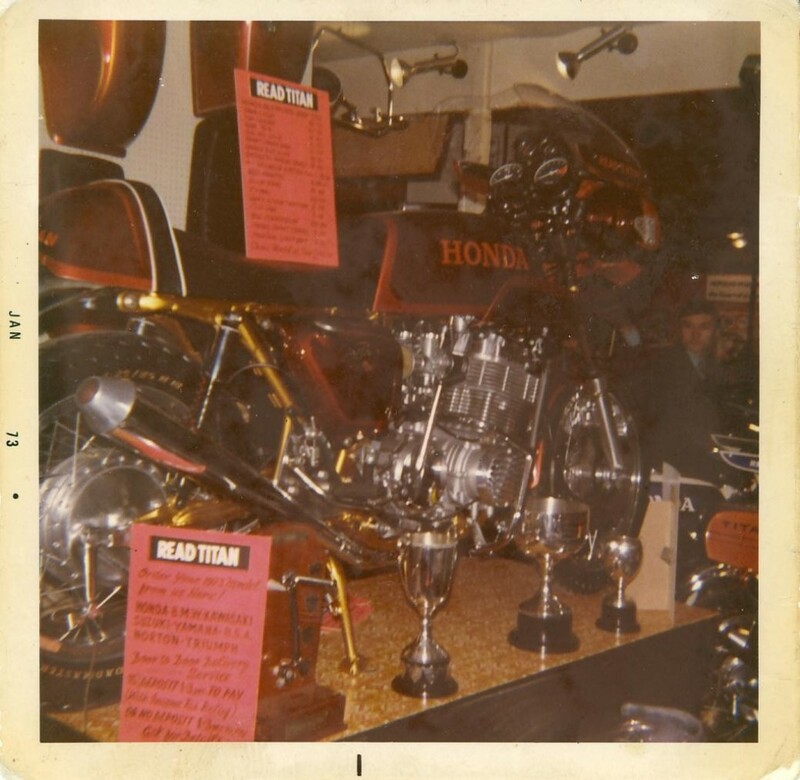 1973 – my Janspeed 960cc race Honda won a bunch of awards in London! After big bikes, I progressed to fast cars. My very first car was a classic Jaguar 3.8S in British Racing Green (followed by two more Jags), and later on, a custom Janspeed 3 Liter Turbocharged Ford Capri which was a seriously quick car in its day. I remember one Saturday having a very early breakfast and then driving it with my then girlfriend through 6 countries from London, England to Switzerland and arriving at her parent’s house near Zurich in time for dinner. Her mother was not amused. Yes, we drive a tad faster in Europe…. A few years later on, I had a business partner in England that had a Ferrari Testarossa which was drop-dead gorgeous and at that time, the fastest car I’d ever driven. I was driving an Audi by then so I was into German cars. In the UK, the big fast cars of the day were Italian exotics, Porches, Aston Martins – and they were very very expensive to own and run. American muscle cars were very rare in Britain because they didn’t make many right-hand drive cars and they drank gas at an alarming rate – a big deal in a country where gas is 3-4 times more expensive than the USA. We all loved the Dukes of Hazzard and saw lots of big muscle cars on TV, but not on the road. When I came to the States I fell in love with the whole custom car scene – you can get away with outlandish cars here that would never be street legal in Europe where we have so many rules and regulations. Still, I could only be an onlooker as I went through over 20 years of miscellaneous nondescript cars and then SUVs while my family grew up. Practicality had to come first. But I always promised myself that one day I’d splash out and get a decent muscle car. I was very patient. To be honest, the muscle car I had thought I might end up getting was a Corvette and I had not paid much attention to Mustangs, Chargers or Camaros. Then one day I was fiddling around in Motor Trend Magazine’s iPad app and read a review on the 2013 Shelby GT500. I’d been so out of the whole muscle car scene (well to be more precise, I was never in it) that I didn’t even realize there were so many Mustang models, far less a Shelby – and although I had heard of Carroll Shelby, I really didn’t know that much about him. Until now. So one minute, there I was reading the GT500 review, and the next minute I had linked to Ford’s website and now I was building up my dream spec on a Shelby! I was still not even beginning to think this would lead anywhere (I was more day-dreaming) but then I found a link to dealers in my area where I could check out if they stocked the one I had just “built” and — Whoa! — There was my exact car in stock at the Athens Ford dealership just a few miles away from me! Okay I thought, this is a bit scary…as it’s suddenly getting awfully real. I made a phone call and yes they had it in their showroom but “it is already sold” they said. Bummer. But they asked me if I would like to see it before it was shipped to the customer. By this time I was extremely curious so within an hour I was there walking in the door of the dealership. Up to this point, I had not been researching or planning to buy a new car at all so I was not even in a buying frame of mind — and yet there it was — in the flesh right in front of me. Wow! It was drop-dead stunning. Its looks oozed power and muscle. I got to sit in it, see the huge supercharged engine, hear the exhaust (oh boy – that’s all it took – my heart leapt when I heard the growl from those 4 pipes!). Now things were deadly serious… But it was “sold”, or so I thought. It transpired that the buyer had not wired any funds yet, so technically it was still available – and I had made a fatal mistake of walking into the showroom with my checkbook in my back pocket. Hmmm. Unconscious decision. So the next minute I had called my wife, stammered something about a Shelby (she knew that name!) and I had given them a holding deposit on the car. So there we were the very next morning at the crack of dawn and after many hours of negotiating and a very spirited test drive, I was driving off the lot in my new Shelby with a huge wide grin from ear to ear. It was rather a surreal experience. 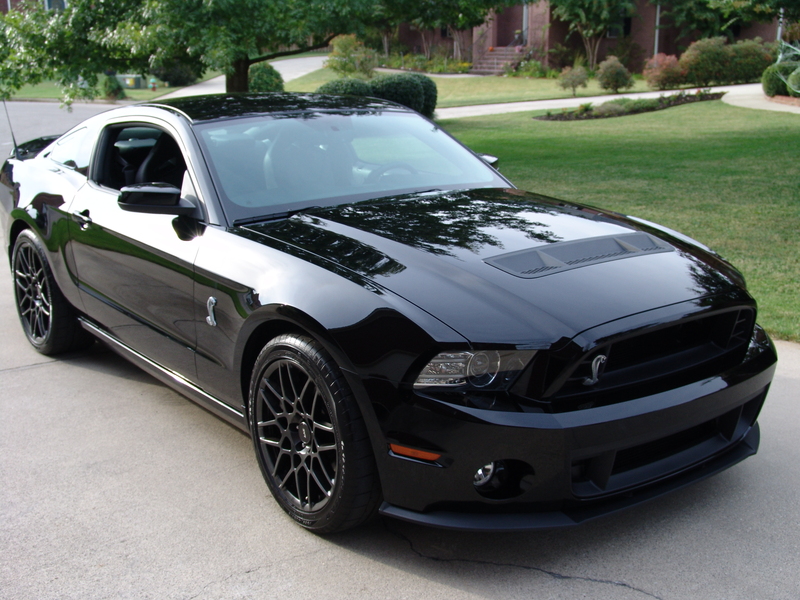 My newly purchased 2013 Shelby GT500 – sitting in my drive! I have never made a decision to buy a car so fast in my life. I always do a lot of homework on a big purchase, but something special happened when I saw that car that day. It took my breathe away and I made a purchasing decision from the soul. I have not regretted it either. The car is everything I expected it to be and then some. It is brutally fast, a stick shift (we Brits love stick shifts!) and a beautiful car. It is the fastest car I have ever owned or driven and although it can do 202 mph (and that’s a lot of bragging rights) if truth be told, I drive a lot more slowly these days than I did back in the UK in the 70’s. 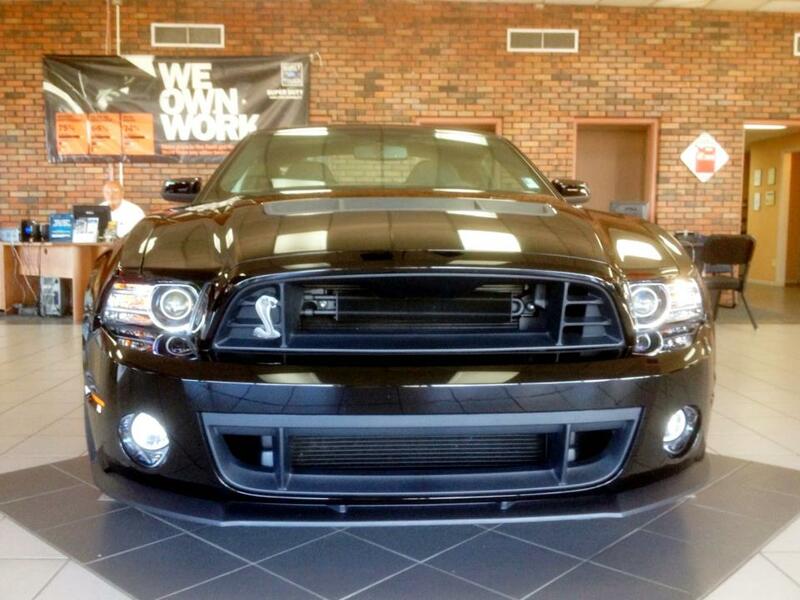 You don’t really have to prove anything in a Shelby. It’s also a car that demands a great deal of respect. I came across a show by Road Testament called “Ten Cars That Want To Kill You” one day and I’ll be darned if the 2013 Shelby GT500 was not second on the list – right after the Hennessy Venom. So my custom tag S0SCARY is very apt – it is a truly thrilling, seat-of-your-pants car to drive. Mustang Clubs and much more – the thrill was just beginning! As we drove off the lot that day there was still another whole aspect of owning a Mustang, and especially a Shelby that I hadn’t yet grasped. As I did all my research and homework after-the-fact, I discovered the true world of Mustang ownership included Forums, Clubs, Meets, Cruises and a myriad of potential customization options. Wow – I really had no idea that was all out there! In the months following, I joined several clubs (including my local Limestone County Mustang Club) and quickly made over 100 great new friends on Facebook. Mustang owners are such fun to be around and very enthusiastic about their cars. The camaraderie is great and we always have a busy schedule of car shows, meets and events throughout much of the year. So here I am, literally self-catapulted right in to the American Muscle Car scene with a whole new lifestyle and a vibrant social network and it’s all happened as fast as that Shelby accelerates. I must add that I owe a huge debt of gratitude to my wife, who traded in her own beloved Miata when we bought the car and who supported me 100% in our decision to buy the car. This was all within just 5 months of marrying me too. She has owned two Mustangs before, bought her own V6 Pony after I got the Shelby and now drives a 2013 GT Convertible, so we are a two-Mustang family now – and yes she drives the Shelby as well as her own! This entry was posted in My original Blog: From Motorcyles to a Shelby - a 44 year journey. Bookmark the permalink. Wow does this sound like me. I recently purchased a 2012 shelby , and like you i never dreamed of owning one. It has 14,000 miles. you made running a blog look easy. The full look of your site is wonderful, as smartly as the content material! to peer a great blog such as this one these days..